Biagio d Antonio (full name: Biagio d Antonio Tucci or Tuccio), Italian painter. He was previously confused with three other painters: Andrea Utili (fl 1481-96) of Faenza; Giovanni Battista Utili (?1465-1516), whose second family name was Bertucci, also of Faenza; and Benedetto Ghirlandaio. His true identity was first documented by Grigioni, and Golfieri and Corbara then linked archival references to surviving paintings. 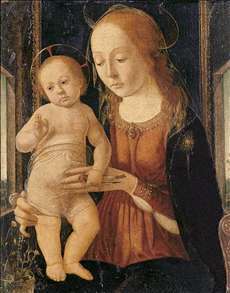 Lightbown excludes the suggestion that he is the Biagio apprenticed to Botticelli, who, according to Vasari, was the victim of a practical joke played by his master. Biagio d Antonio was an eclectic painter whose style reflected the influence of many of his contemporary Florentine and Tuscan painters. He started his artistic training in Florence in the 1460 s where he became heavily influenced by the work of Pesellino and Fra Filippo Lippi, mimicking their elegant, linear style of modelling. By 1476, Biagio d Antonio had left Florence for Faenza, where he established a large bottega and actively pursued commissions from all over Italy. In 1482 he was summoned to work in the Sistine Chapel with the most distinguished artists of his day. 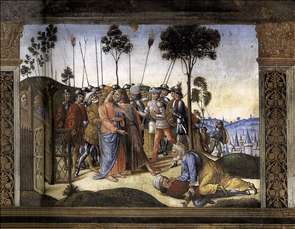 He assisted there Cosimo Rosselli in the execution of the Last Supper. He is credited with the execution of two "window paintings" appearing in this fresco, namely with the Arrest of Christ and the Crucifixion. 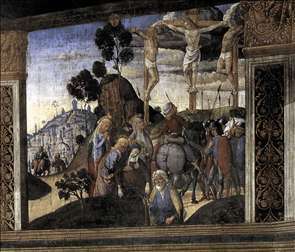 He is also recorded as assistant to Perugino for the decoration of the Palazzo della Signoria in Florence. In his later period Biagio d Antonio was particularly impressed by the work of Verrocchio, Domenico Ghirlandaio and also Perugino. See more details about "Arrest of Christ"